How did we manage without… the Smartphone? This month The Training Pack is celebrating its 21st birthday! The anniversary has got me thinking about some of the developments that have changed the way I do business. 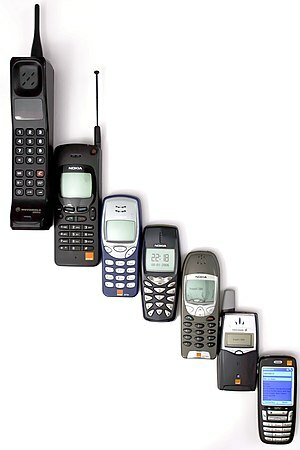 When I started in 1992 the mobile (cell) phone was in its infancy and was beyond the budget of most individuals. Such mobile phones as there were were usually car phones because they were too big to fit in a pocket or handbag. I remember my husband borrowing a mobile phone from work when I was heavily pregnant with our second child. It was the size of a brick. On a day very close to my due date he and another Dad took our four and a half year old daughters to their first ever class party. My friend and I gave them strict instructions to stay with then and not to go to the pub. They’d been gone for an hour or so when the house phone rang, it was the mobile ringing from the pub! However it had self dialed and I couldn’t get David to hear me telling him to disconnect. That call blocked our landline for quite some time and in those days we didn’t have the option of texting so David didn’t even know he was in trouble! The lack of a mobile phone in the early days meant I had to be really organised. I had to make sure that, every day, I left a contact number with school and nursery so they could find me in an emergency. My prospects and customers had to leave me an answerphone message.Getting my first mobile phone was liberating even though the features were pretty limited. Oh how things have changed, now I use my mobile phone to message people, to check my emails, to take photos, to search the web, to check the weather, to calculate VAT, to find my way, to take notes and, very occasionally to make calls. I could listen to music, watch videos, play games and lots more. If only the battery life had developed as fast as the things we can do with our phones. The ability to stay connected with my business wherever I am is certainly an advantage much of the time. However I do think that smartphones contribute to the stress that seems to be every increasing for many people. We are expected to be forever available, to respond to calls and emails at the drop of a hat, to monitor work whilst we are on holiday. I think as responsible business owners we should set an example to our teams and make it clear that when we are on holiday we only deal with extreme emergencies. But my biggest gripe about the mobile phone is that people feel they have to be constantly connected. They are on Facebook or reading their messages when they should be listening to a lesson or a presentation. They can’t switch off for an hour or two whilst they attend a meeting or training session. They forget to put it on silent when they go the theatre and despite the law too many people use their phones when driving. What do you think? Does your mobile add to your stress levels or diminish them? Could you run your business without your phone? Do you have more than one mobile phone and if so why? This entry was posted in Business development and tagged Business, Business and Economy, Facebook, Mobile phone, Smartphone by glendashawley. Bookmark the permalink. So true! I don’t think that we could ever go back to just calling and texting with our phones. I’m just back from two weeks on holiday and my Smartphone has allowed me to stay in touch with my business in a way I couldn’t have done 21 years ago.